Vaccine Mandates, Medical Exemptions & Healing — janny: organically. The recent government vaccine mandates have stirred the topic like never before. While there is still plenty of mud slinging from either side, parents who may disagree over vaccination as a whole are uniting over the fact that these mandates infringe on our parental rights and liberties. This post is written to those seeking to understand their options within the confines of new legislation, like California's SB277, which eliminated the Personal Belief exemption leaving a medical exemption as the only option to follow an alternative schedule or refuse any/all vaccinations for school or daycare. (Read Dr. Sears's breakdown of this law here). Several states have instituted similar laws and a National version of the law is underway under the name HR 2232 or "The Vaccinate All Children Act of 2015." The bill declares all state public schools must mandate blanket vaccination to all students in order to receive federal aid money. Note: There is a similar law in Oregon, SB 422, though non-medical exemptions are still available even though many authorities dispute this. Read more about this here. Fortunately, these laws are causing more and more parents to question vaccines and their safety. 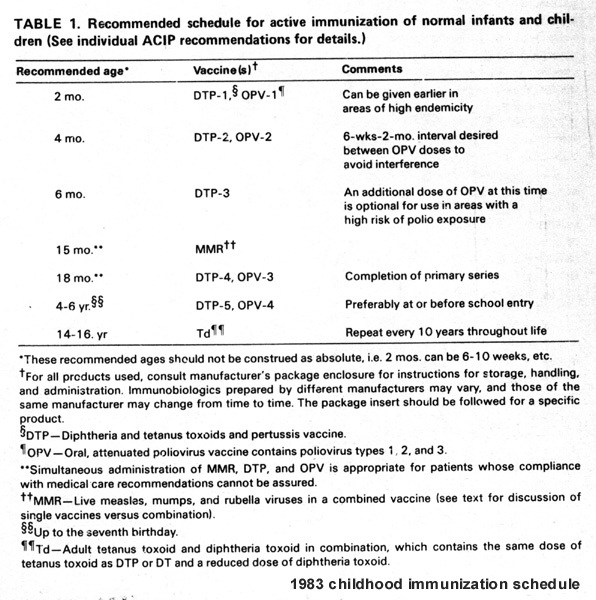 After all, the CDC schedule looks nothing like it did when we were kids! And then there is this. Could it be the real reason your doctor is pushing those vaccines? They must hit the target % to get paid for any children. I am well aware my refusal to stay silent on this topic comes across to many as though I hold an anti-vaccination stance when I am simply pro-information. Even within our family, after we underwent extensive testing, we concluded some of us qualify for a medical exemption from some or all vaccines, while others do not appear to be at risk. We made our decisions with a doctor, armed with extensive research and medical and scientific evidence specific to each member of the family. If you begin to see several pro-vax posts in the coming weeks, this may be the source. I might even mention the bloggers are legally obligated to inform readers they are being compensated for their post, but we'll see if that happens. The United States gives 2-3 times more vaccines to children than most developed countries and coincidentally boast some of the highest rates of childhood and long term health concerns like asthma, diabetes, food allergies, leukemia, developmental delays, tics, ADHD, autism, lupus, arthritis, eczema, epilepsy, Alzheimers, brain damage while the pharmaceutical companies are no longer liable for any damage caused. You may believe vaccines are completely safe and effective, and if that's the case, this post is not for you...or maybe it is. I've written a couple articles about vaccination, specifically about Measles and Polio and another on how Christians should approach this issue, but I continue to receive questions about medical exemptions and how to even begin! My suggestion is to start researching, get lab work done, do more research, discuss with a knowledgeable doctor and then research some more. It would be unwise for one to determine what is best for their family without proper research. I will provide information and links for you to begin your quest. — Robert F. Kennedy Jr. Remember, the media is not only pushing a bias in accordance to their bankroll but refuse to mention the growing epidemic of holistic doctors being murdered after standing up for vaccine education and choice. Doctors and Scientists exposing the misconduct behind the vaccine industry are being fired, set-up, discredited and targeted. Dr. Judy Mikovits, PhD., discovered vaccine contamination and once she presented her findings, she was told to destroy all her data, threatened, jailed and issued a 4-year gag order. The gag order is up and she's talking. For more on this story, her interview is available here. You should be looking at evidence-based, peer-reviewed studies that have no conflicts of interests. One of the first things I do when reading a paper is to look at who funded the study or issued grants. Many, if not most, of the science that supports a pharmaceutical product can be found to have been monetarily compensated by that same pharmaceutical company. You'll also be looking at individual ingredients alongside your families medical history and lab results as well as adverse reaction potential as noted by medically accepted sources (like the NIH, PubMed and several others which I'll link to in my batch of sample questions below). The Refurbished Rogue compiled a GOLDMINE of peer reviewed vaccine research - hats off to her for making this available! Why has the number of vaccinations skyrocketed since our childhood (1983 vs 2014) and is it a coincidence that so has the likes of cancer, ADHD, allergies, dare I even say it, autism? Are unvaccinated children healthier than those vaccinated? Be prepared to spend hours researching each vaccine and don't expect to come to any conclusions over the weekend! The CDC states explicitly, “For children with a prior history of allergic reactions to any of these substances in vaccines, parents should consult their child’s healthcare provider before vaccination. Depending on results, one might qualify for a temporary or permanent medical exemption from any number of vaccinations with the approval of a licensed physician. What good is all this testing if you don't have a doctor who is knowledgeable in the field of genetics or may ignore allergy or autoimmune concerns? A few sites have compiled a few listed of doctors willing to review tests and evidence before making their recommendations. If you have a genetic concern, make sure to ask them if they are capable of speaking to your concerns before making an appointment. Remember, your doctor works for you! If they are unwilling to run testing or find proper answers to your questions, find another doctor! In my experience, the best doctors you'll have to pay out of pocket for. The others are paid by the insurance companies and therefore answer to them. If vaccination has already occurred or is unavoidable, there are many options to prepare for and help heal from the process. For now, you can home school your children if you do not qualify for an exemption and do not feel comfortable vaccinating in whole or in part with the CDC's mandated schedule. Best of luck to everyone seeking health for their families! **This is not a place to dispute vaccines efficacy (or lack thereof), it is a post specific to helping parents who need to explore a medical exemption get information. If I find your comments inappropriate for this post's content or containing inaccurate blanket statements, they will not be published. Essential Oils: Why I choose Mountain Rose Herbs + An Exciting Giveaway!